Though called laptop in many locality, laptop isn’t really meant to rest on your laps. You know what might happen if you do that, don’t you? Burnt laps, that’s what. So why risk it? 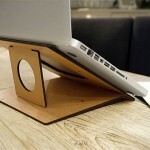 And that’s precisely why you need a laptop stand; to provide a place for the laptop to rest and you, to type comfortably. That’s precisely what Lapdeck Recyclable Laptop Desk is designed for and believe it or not, it will only cost you 10 bucks. Yes. You heard me. Only 10 American dollars and it is totally collapsible so you can pack it into your carryon and bring it wherever you go. So how did Lapdeck achieved this almost unbelievable pricing? The secret lies in the material. 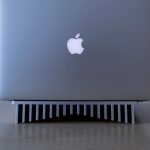 Described as “one carefully engineered sheet of corrugated fiberboard,” Lapdeck allows you to use your laptop in comfort on your bed, couch, or even in the car and since it is collapsible, it can be pack flat and deploy in a matter of seconds, making it an ideal travel companion for laptop-reliant globe trotters. When in collapsed form, it can be slipped into a standard padded envelope for protection and storage. There’s a catch here though: it is made out of corrugated fiberboard and so it is not going to last you a lifetime; it is probably good for around 4 to 12 months with dozens of collapsing and expanding, depending on your handling. So if you don’t ‘manhandled’ it, the longer it will last. Before you exclaim ‘what?? ?’ in disbelieve, you have to remind yourself that it is only ten bucks and if you ask me, that’s kind of value for money and perfect for folks who travel often with their laptops. See the Lapdeck in action in the embedded video below. P.S. Lapdeck is a project on Kickstarter and at the time of this writing, it is well over 100 percent funded, which means it is a go.